One of the most famous hits from the Eighties is actually a song from the Seventies: 'Are 'friends' electric?' was released in 1979. 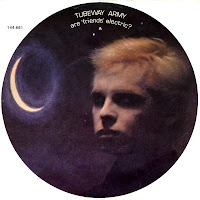 Tubeway Army consisted of many different musicians, but the main members were Gary Webb (a.k.a. Gary Numan) and Paul Gardiner. 'Are 'friends' electric?' became their first hit after appearances in 'Whistle Test' and 'Top of the pops'. The single climbed steadily to stay at number one in the UK charts for 4 weeks. After this hit, Tubeway Army disbanded and Gary Numan went on solo.